**The Sunflower League elected to bring back open scheduling in week one after a ten year absence, and it went wonderfully by most accounts. 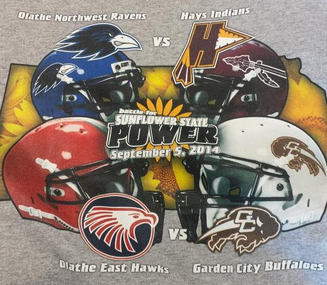 Perhaps the most enjoyable event was the doubleheader at CBAC, dubbed the "Battle for Sunflower State Power." Olathe Northwest hosted Hays in the 5:30 pm time slot, before Olathe East went up against Garden City in an 8:00 pm game. Both games seemed to have a playoff type atmosphere, which was awesome for this early in the year. I can only hope the open week one scheduling continues, and that more of the league's teams will follow the lead of the Olathes who really went all out to find unique match ups. **Olathe North head coach Gene Wier recorded his 200th career victory with Olathe North on Friday, which is an incredible accomplishment. To put that into perspective, only one other league coach, Olathe Northwest's Chip Sherman, has more than 200 career wins, and Sherman's have come at four different schools. Free State, 2008: Free State began the season 1-3, but won eight of their next nine games and made it to the 6A state championship game. SM West, 2012: The Vikings began 1-1, with an aggregate point deficit of 34-42, but went on to rattle off 11 straight wins in claiming the 6A title. **I think we can all be thankful for the field turf which now graces every stadium in the Sunflower League. If you played or witnessed games in the league during the days of natural grass, you know how an early season rainstorm could basically ruin a field for the rest of the year. This feeling was especially aprapos as the rain poured down on CBAC Friday. Could you imagine the condition the former CBAC grass would have been in had two games played back-to-back games on wet and muddy field? SM East: Most teams don't play their best football in week one, but the Lancers managed to hang 40 on one of steadier programs in Johnson County. As SM East continues to build towards mid-season form, watch out. Also, head coach Dustin Delaney reached 12 wins in fewer games than any head coach in the history of the Sunflower League (the previous record holder was Olathe North's John McCall who won 12 of his first 15 games; Delaney has won 12 of his first 14). Olathe East: The Olathe East players, student body, and fanbase had the energy of a program amid a 50-game winning streak on Friday. I mean, I haven't seen that kind of energy from a program since Olathe South's title run in 2011. And it was only week one. The only possible weakness I see in Olathe East is a lack of size in their offensive and defensive fronts, but I don't think it will adversely impact their chances at a state title. Sunflower League exposure: Teams from the league went up against foes from Kansas leagues including the EKL, AVCTL, and the WAC, as well as one game in the state of Arkansas. The final tally: 5-3. Lawrence: The Chesty Lions appear to have a ton of potential, but they don't really know how to win -- yet. At one point early in the second half they only trailed Blue Valley West 14-7, but by the end of the third quarter that deficit had ballooned to 37-7. Shawnee football: The two Sunflower League programs which pull students from the city of Shawnee -- SM Northwest and SM North -- have combined to go 5-34 since the start of the 2012 season. Heck, even Mill Valley (the 5A program which pulls from western Shawnee) lost their season-opener to St. Thomas Aquinas. The Preseason No. 1 Spot: For all we know, Olathe North will go 13-0 and claim their ninth state title, and this close win in week one will go down as a complete aberration. But as it stands, there's no telling on the injury status of quarterback Cole Murphy, and clearly the Eagles had issues without him leading things. In the age of social media, based on what we've seen the past few years, preseason hype may be more of a curse than anything. 1. 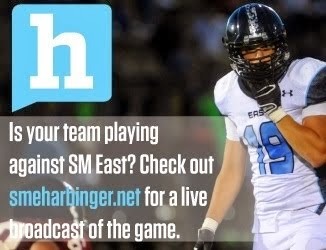 SM East (1-0): It doesn't appear the Lancers lost a step from their torrid pace of 2013. Not only did they blow the doors off of Gardner-Edgerton's defense, but they also completely shut down a Marvin Diener offense, which is by no means a small task. 2. Olathe North (1-0): The Eagles are dealing with a boatload of personnel issues, ranging from injuries to suspensions. They also had a four-hour bus ride leading up to a game with an unfamiliar foe. For that reason, they get a pass in week one, but a repeat type performance would be concerning. 3. Olathe East (1-0): There's two things you need to know about Olathe East. The first is that they probably have as much talent at their skill positions as they've had in five to ten years. The second is that they truly believe the 6A state title is theirs to lose. Keep an eye on the Hawks. 4. Lawrence Free State (1-0): The Firebirds played a pretty cohesive game considering how many starters they lost from a season ago. Quarterback Bryce Torneden will give Free State a chance to beat anyone they play this fall. 5. Olathe South (1-0): The Falcons made a statement in week one, thrashing the seven-time state champion Hutchinson Salthawks, in Hutchinson, by 22 points. Granted, the Salthawks were breaking in a new head coach, but Olathe South came to play and they look primed to make waves this year. 6. SM West (0-1): The Vikings showed us pretty much what we expected in week one. There were moments where their athleticism and skill showed, and there were moments where it looked like they could go 3-6. They'll need to hash out their quarterback spot before they can accomplish anything. 7. Lawrence (0-1): I didn't feel LHS' 24-point loss was an accurate snapshot of the talent levels of the two teams on Thursday. But Blue Valley West was more seasoned, and they played like it. LHS must cut down on the mental mishaps, the poor tackling, and the youth mistakes going forward. against Hays. Photo KC Star. 8. SM South (1-0): The Raider's 28-point victory against SM North was pretty much what we expected in this game. SM South's next three games are a brutal stretch against the top three teams in the Power Rankings. Anything better than three losses would be big for the Green and Gold. 9. 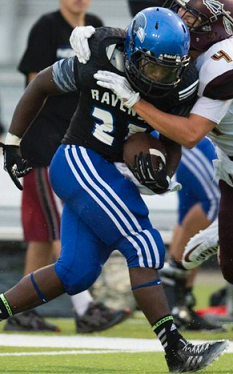 Leavenworth (1-0): Mark Littrell's impact on the Pioneer program has become quite evident. The team's 19-0 shutout of Great Bend was impressive, and I think it was a wake-up call to the rest of the league that the Pioneers are capable of making some noise this fall. 10. Olathe Northwest (0-1): The positive from Olathe Northwest's loss on Friday was that they probably won't face as athletic of a quarterback as Alex Delton the rest of the way, and they did a pretty good job containing him. But bottom line: the Ravens need to win some of these close games. 11. SM Northwest (0-1): The 29-point shutout loss to defending Class 5A champion Blue Valley wasn't the result the Cougars had hoped for, but there were positives. They played the Tigers pretty close through the first half, and the tough opponent will make them better in the coming weeks. 12. SM North (0-1): Well, the losing streak has now reached 20 games. You can't really put that on the current group of Indians, but I'll give them all the kudos in the world if (when) they can end the streak. If they can't do it in week two against SM Northwest, the streak might last until districts. I don't understand the comment for Olathe North about they get a pass because of the 4 hr bus ride. Could u explain that in detail! I think what Eli means for the bus ride is that when you sit on a bus for 4+ hours, your body will be practically numb once you get off, your mind will probably be fuzzy, and you'll generally just feel tired. He reported awhile back about how Rockhurst had taken a 6 hour bus trip the day of the game and got dominated by a team that was more or less on the same level. I think Olathe North could have destroyed Roger's Heritage if they had been given a night to rest. Garden City had the 6 hour bus ride against OE and Hays had a decent ride against ONW, so I really don't buy the bus ride thing too much. Maybe a little "bus-lag", but kids get hyped pretty fast. The league (and FS) will find out Friday where ON is at. I expect ON to be as good as advertised... I think FS is too! Should be a good one. Go 'Birds!